The 2011 Honda CR-Z is a signal that the hybrid world is changing. 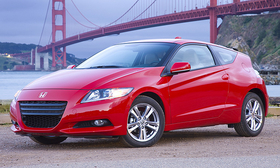 The CR-Z is a sporty-looking, two-passenger, affordable, three-door hatchback. The car is aimed at the youth market. The styling is a head-turner. Until the CR-Z arrived, hybrid cars have been limited to family sedans, such as the Honda Insight. As part of that sporty image, a stick shift is standard. In fact, the CR-Z is the only hybrid car available in North America with a manual transmission. The car can be ordered with an automatic if shifting gears isn't the driver's specialty. Until the CR-Z arrived, hybrid cars have been limited to family sedans, such as the Honda Insight, the Toyota Prius and Camry, the Ford Fusion, and several others. Automatic is the only transmission in these models. Sure, the original Honda Insight hybrid was two-passenger, but it was anything but sporty. The car was sold from 1999 to 2006. This decade, the industry will offer a wide range of hybrid cars and models. Today, we're starting to turn the corner.